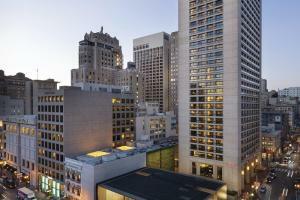 The iconic Grand Hyatt San Francisco features a stylish urban ambiance that is classic and contemporary. This newly transformed hotel welcomes guests with sophisticated décor and modern upscale amenities. Revel in completely redesigned guestrooms and suites featuring innovative and residential style amenities. All the sights and sounds of San Francisco beckon just outside the doors of this ideally located hotel.